The best thing about Ron Howard's latest film may be that it knows what it is. So this is what Hollywood is for. It's easy to forget, especially on the heels of a movie summer as disappointing as this last one, that there are certain things that big-studio motion pictures can do very well. 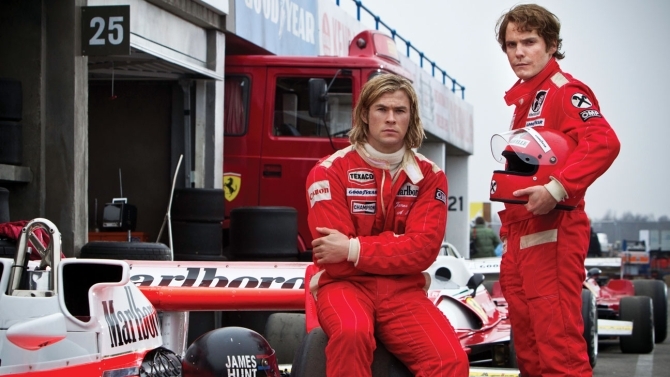 Take Rush, the latest film from director Ron Howard and easily one of his best. This "based on a true story" auto-racing movie does a number of things very well. But just as important to the movie's success are the things it declines to do at all. The contrasting styles and personalities of Hunt and Lauda could hardly be more striking. Hunt is gorgeous, charismatic, fond of booze and drugs and women, and recklessly drawn to the mortal nature of his chosen sport. Lauda, by contrast, is precise and aloof, with prominent buck teeth that earn him the nickname "the rat." While Hunt enthuses that a Formula One car is essentially "a bomb on wheels," Lauda sees racing as merely a means to an end. "If I had more talent and could win more money at something else," he explains at one point, "I would." Hemsworth (Marvel fans know him as Thor) is excellent as Hunt: charming, gregarious, and, in his way, entirely genuine. But it is Bruhl's Lauda--sulky, diffident, obstinate, rude--who gradually runs away with the film, inch by inch, checkered flag by checkered flag. Though Bruhl was good as the lovestruck Nazi war hero Frederik Zoller in Tarantino's Inglourious Basterds, his performance here is a minor revelation, nuanced, unsentimental, and utterly original. Howard's direction is crisp and lively, neatly interweaving the racing sequences and character studies for a satisfying blend of the kinetic and dramatic. The 1976 Formula One season itself (the details of which I will not divulge here) offers a cinematic arc brimming with tension, spectacle, and surprise. If this sports story didn't exist, Hollywood would have had to invent it. The neatest trick Howard engineers, however, may be his forbearance of the narrative larding in which big-budget films such as this one seem almost inevitably to enmesh themselves. There's no tedious backstory here, no maudlin explanations of why Hunt and Lauda came to be the men they were. Though the movie cycles through both ups and downs, it does so efficiently, neither basking in success nor wallowing in misfortune. And even as Howard offers up this clash of outsized personalities (and the moral paradigms they perhaps represent), Rush remains refreshingly agnostic on the subject of their relative merits. There's no message here--or rather, any message one chooses to take away will be equivocal, conditional, and lacking the whiff of sanctimony that so often pervades big awards-season fare. Rush is not a particularly deep film. But more importantly, it is not a film that mistakes itself for deep. However fascinating they may have been, Hunt and Lauda were, after all, race car drivers, their story the perfect grist for a well-crafted but unassuming entertainment like the one Howard has provided us. And this self-knowledge makes Rush, in some ways, a wiser film than many that aspire to loftier goals.